Who knew that you could buy your own, rare Przewalki horse for a mere $600? 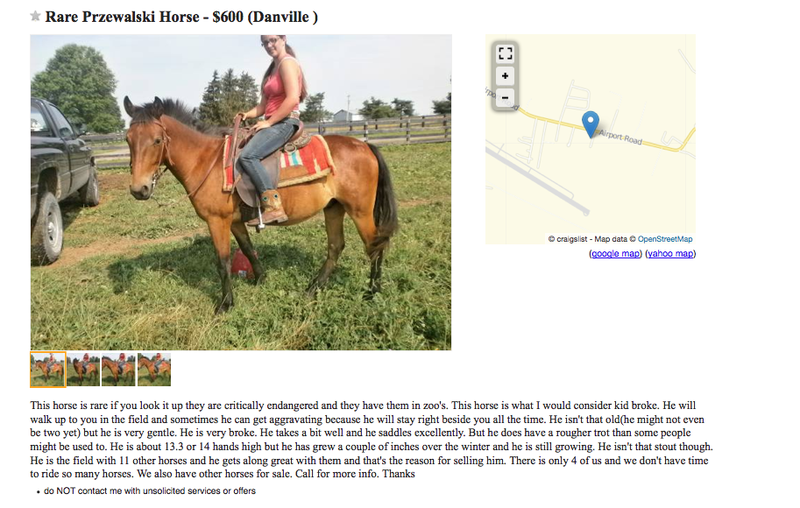 Only on Craig’s list! This horse is rare if you look it up they are critically endangered and they have them in zoo’s (sic). This horse will walk up to you in the field and sometimes he can get aggravating because he will stay right beside you all the time. You have to give them credit for knowing about the breed and spelling it correctly, but the only things that poor horse has in common with a Przewalski horse is four legs, a tail and a mane with a Mohawk trim. 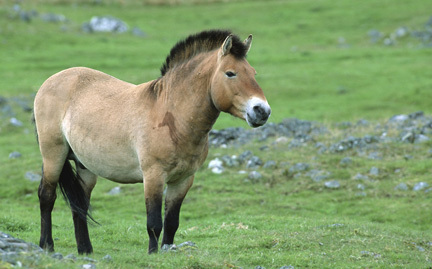 Here is what the “real” Przewalski horse looks like. Not even close. In fact the Przewalki horse, which is native to Mongolia, is one of the only true “wild” horses (as opposed to feral horses, such as mustangs, which are descended from domestic horses that escaped). Hardly a breed that could ever be described as “kid broke”. The breed was considered to be extinct in the wild in 2008 and there are about 1500 of them alive today. All Przewalski horses in the world are descended from nine horses that are descended from 15 captured horses captured around 1900. So, if this really is a Przewalski’s horse then it needs to scooped up right away because he is priceless! The ad doesn’t say but I hope they didn’t cut the family jewels off. A Przewalski horse gelding just wouldn’t cut it. Don’t get me wrong — he’s a cute, scruffy little horse that seems to be in good weight, but it would take a real leap of faith to turn him into a Przewalski’s horse. That is too funny. I don’t think I’d be able to spell the P. horse name without Google!